Whatcha gonna do, brother, when PowerMania runs wild on you? Not every hero comes from noble or innocent beginnings, my friends. Spider-Man, Daredevil and the Uncanny X-Men were given powers through no fault of their own. Captain America chose his path to serve his country and battle the forces of evil. And the Incredible Hulk and Fantastic Four received their gifts only by accident while they were in the pursuit of scientific advancements. Typically, if a character seeks out superhuman powers on purpose, it is for their own selfish interests and, thus, they become a super-powered criminal or villain. In 1972, Archie Goodwin, John Romita Sr. and George Tuska created a hero unlike any other in the Marvel Universe. Carl Lucas, a hardened street tough serving time for a crime he didn’t commit, volunteers for a cell-regeneration experiment based on ideas from Captain America’s super-soldier formula. A prison guard with a grudge against Lucas sabotaged the experiment and the process left him with super-human strength and durability. His power allows him to escape from prison unharmed and he heads to New York City, deciding to use his new powers to launch a business venture as a “Hero for Hire” under the alias Luke Cage. Now that the stage is set, true believer, pour yourself a cup of the delicious brew we love so much and get ready for an epic showdown which could not be contained even by the squared circle! Upon returning from out-of-town adventuring to his 42nd Street office, our hero finds himself flat broke with a desk full of unpaid bills and a noisy new tenant next door. That tenant turns out to be a down-on-his luck wrestler who crashes through the wall in an inaccurate attempt to flatten his punching bag! After the obligatory “Sweet Christmas!” from Luke, the masked wrestler looks up from his tumble and apologizes for breaking the wall. Luke isn’t in much of a forgiving mood, however, due to his financial woes and business struggles, so he hoists the wrestler up by his shirt, calling him a “big, dumb, overweight ox”. The wrestler prevents being slugged by Luke with quick elbow to the jaw, one strong enough to put Power Man on his knees, saying “Pretty fancy move, fatso!”. Confused more than angry, the wrestler calmly asks why Luke keeps calling him names, wondering if his manager, Bernie, was right in saying the man next door “got a chip on yer shoulder or sumpin”. Power Man just gets more angry and complains how people walk all over him, and he’s determined to nip that trend in the bud. He ends up clobbering the wrestler with a haymaker, crunching his hands in his iron grip and dodging the wrestler’s every attempt to stop the hostilities. Essentially, Luke insults the guy and beats on him for a while despite no interest in a fight by the masked wrestler. Right before he puts the man down for the count, the wrestler’s manager, Bernie, arrives and begs Power Man not to flatten his client, who is named Willie Dance. Luke puts the man down on the ground and despite Willie’s claims that Power Man kept saying “mean stuff” and that he “ain’t nice”, ends up apologizing to Luke once again for having “messed up your day”. With Bernie offering to pay to have the wall repaired, the two leave and Power Man is left behind feeling like a first-class jerk. The formula repaired not only Willie’s broken-down body, but sharpened his mind, clearing the fog in his brain he’s suffered for so long. However, with clarity also comes increased aggression, as X the Marvel shreds the door to the gymnasium and then recalls the person who treated him so harshly earlier today… Power Man! X bursts through another part of Hero for Hire’s office wall and before Luke can react, he gets blasted in the face with a flying drop-kick. “Youse is gonna pay for laughin’ at X, mister! Youse is gonna DIE!” X’s newfound strength and agility allow him to manhandle Power Man with ease. X manages to hip-toss Luke through a door, hurl a steel filing cabinet into Luke’s gut and catch Luke in a flying body press which sends both combatants careening out of the window toward the street below! They land on the marquee for Times Square’s Gem Theater (where the Hero for Hire offices are set above), which knocks the wind out of Power Man, though “X didn’t even feel it, mister!”. Luke decides he’s had enough, however, and sends X flying with a pair of thunderous blows. The response from X is quick and effective, as he lands an upside-down leg scissors on Power Man, flipping him head-first into the ground, followed up by an overpowering arm-bar, demanding that Power Man submit! Somehow, Luke finds a point of leverage and breaks X’s vice-like grip. Meanwhile, the crowd of onlookers has attracted the attention of a certain disgruntled wrestling manager who sees the action and is astonished to find his friend Willie tussling with a super-hero in the middle of the street! X plans to end this fight in permanent fashion by breaking Luke’s neck with a snap-mare, but Power Man’s steel-hard body prevents the plan from succeeding. X decides that he’s had enough and prepares to fling a chunk of brick wall at his enemy just as Bernie is chasing down the street, calling “Willie, no! What’re yuh doing, yuh crazy jerk?”. With his super-human strength, X fires his projectile straight at Power Man’s chest, which bounces off harmlessly from Luke Cage, but no-so-harmlessly ricochets a fragment straight at Bernie’s head! X’s eyes burst open in shock at the realization that his friend has been hurt, and he races to Bernie’s aid. “Come back here, bro’! I ain’t done with you yet!” calls Power Man, and he proceeds to smash X in the back. “Agghhh! Mister stop it! Please!” pleads X, desperately trying to get to Bernie’s side. Even through another two-handed punch from Power Man, X ignores the man he’s been trying to kill and leans over the barely-breathing form of his manager, begging Luke to help. “He took care o’ me my whole dumb life — like he wuz my old man — do somethin’, mister — please?”, but there is little to be done while an ambulance makes its way to the scene. The police stand armed to take down X, but he tries to assure them, saying “Youse don’t need no guns, officer. I ain’t gonna hurt nobody else”. It’s then that a startling metamorphosis occurs and X shrinks down to a smaller frame, one with soggy muscles and a large gut to match. It’s just normal dim-witted Willie Dance who stands before them now, asking “Can I go wit Bernie to da hospital? He always hated dem places. Hated to go dere alone. He used to say if he went in alone he’d never come out!”. Seeing all this unfold, Luke’s conscience is as battered as his body, and he realizes that some people have problems far beyond his financial concerns. And, of course, he rightly feels like a complete heel for attacking his foe while an innocent bystander lay there dying. Luke Cage would go on to a storied career within the pages of Marvel Comics over four-plus decards, joining with teams such as the Defenders, Fantastic Four (replacing a de-powered Ben Grimm), Thunderbolts and several incarnations of the Avengers. He may best be known for his partnership with martial artist Danny Rand in the series Power Man & Iron Fist (Luke Cage’s own book featured Iron Fist in issues #48-50 and the title was officially changed to Power Man & Iron Fist with issue #50, lasting for a highly respectable 125 issues). The hero who no longer bears the moniker “Power Man”, Lucas Cage (a name he has since legally adopted) has battled an eclectic bunch of baddies in his chosen vocation. These have included mobsters, drug traffickers, super-powered racists and well-known villains such as Zzaxx, Nebulon, Chemistro, the Living Monolith, Sabretooth, Tombstone, Fu Manchu, Hammerhead, the Purple Man and Electro. It is likely that frequent followers of Comic Impact are already aware of the recent news from Netflix involving our favorite Hero for Hire. Among their plans for other upcoming exclusive programs, Luke Cage will join a handful of other Marvel Comics heroes for their own individual 12-episode shows to be concluded by a gathering of heroes called The Defenders. This will only be available only to subscribers of Netflix’s streaming service, but you have plenty of time to get ready because principal filming will have only just begun by the time you read this. Fans of Power Man – including your steadfast scribe – are looking forward with great anticipation to his debut on the small screen. In the meantime, faithful front facers, there are plenty of back issues and trade paperbacks starring Mr. Cage for you all to read and enjoy along with a steaming cup o’ joe! Fare Thee Well! 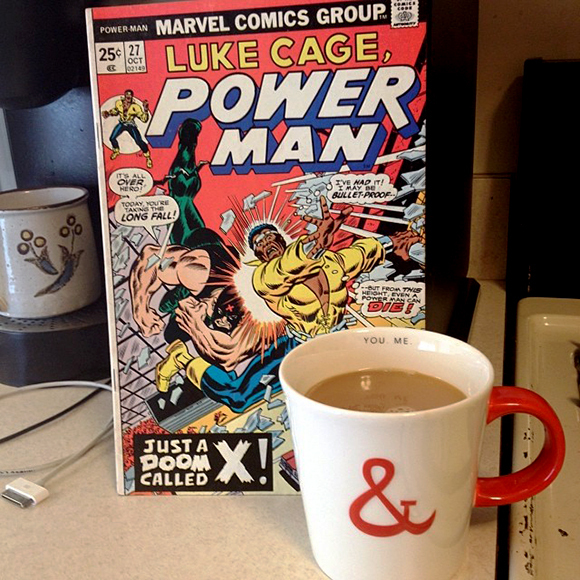 Luke Cage, Power Man #27 is written by Bill Mantlo, penciled by George Perez, inked by All Williams, colored by Diane Buscema, lettered by John Costanza and edited by Marv Wolfman with a cover by Ron Wilson and Frank Giacola.